Our Inactivated rabies vaccine, INDIRAB is prepared using the strain obtained from Centers for Disease Control and Prevention,USA. A cell culture-derived vaccine, it is produced in Vero Cells, inactivated, and chromatographically purified. 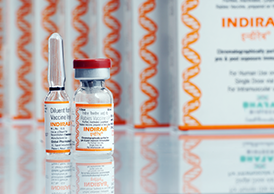 INDIRAB has been extensively evaluated clinically for post- and pre-bite applications and is well-tolerated with minimal or no side effects.